DIY is hot and we are all very aware. The rising trend in DIY currently is Pinterest parties. Women are getting together bringing supplies and having what’s called 'Make Days' aka Pinterest parties. They are making their own crafts, beauty products, and health remedies. This is such a fun and creative way to get together or get to know someone. This is also great for kiddos and keeping them entertained at parties. DIY kids’ parties have become very popular as well. They can make their own chalks or toys even costumes to use at the party immediately. Kids and parents alike are loving this. It is such a fun way to teach lessons and creativity. 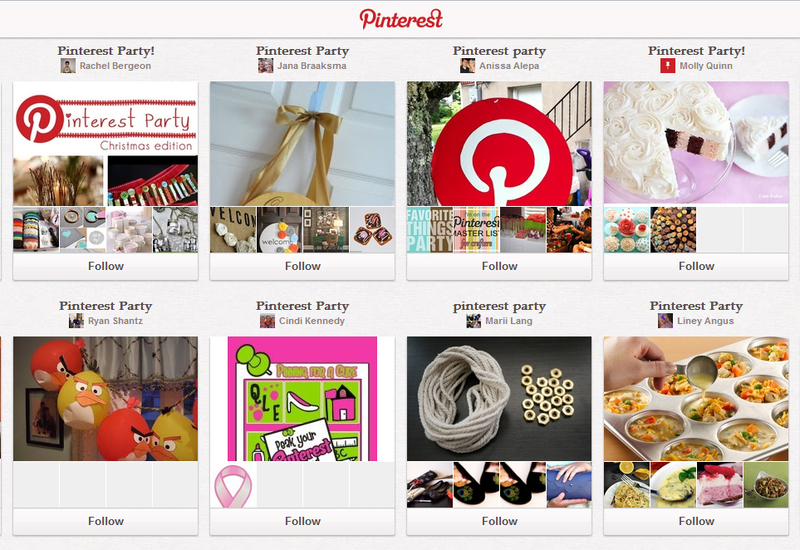 You and your friends create a group craft board on Pinterest, where everyone adds pins of crafts they'd like to make. OPTION 1: The host picks one or two simple crafts off of the group board and purchases the supplies so everyone can make them during the party. FOOD Make the party a "Pinterest potluck" and asks your guest to bring a dish they found on Pinterest. My Big Day is BIG into pinning! The Huffington Post posted a fantastic article on things you shouldn't do after you get engaged. Writer, Sandy Malone hit the nail on the head! From house hunting, to wedding gown shopping and to time spend on Pinterest, to wedding weight loss ... we 100% agree with Sandy's observations. If you are a bride, or have a friend who is engaged, do her a favor, and send her this article! CLICK HERE for the article on 10 Things You Should NOT Do After You Get Engaged. You'll thank us for it! Aisle Style with The Knot and Ideeli! Attention all brides, wedding guests, and thrifty shoppers! If you haven't signed up for Ideeli yet, where have you been? Ideeli is a company that offers limited time sales on incredible brands at EXCEPTIONAL prices! Ideeli is a My Big Day favorite! To shop, you must sign up with Ideeli to receive alerts. It's free, and easy! Fairys are so 'IN' these days! My Big Day sees fairies in weddings regularly. And have you noticed the upswing in tutus and fairy wings in stores? Well, Rubi's & Diamonds Studio in Denver caught on and has made an incredible business out of the popularity of fairies! They have a photo studio and will give your princess her very own fairy photo session for just $25! Now if your little princess is in the market for her very own customized dress/tutu, My Big Day highly recommends Butterfly Kisses Baby Bow-tique in Northern Colorado. The owner, Heather, will customize a handmade creation for you! Not only are her creations amazing, you can't find a better price--- even on Etsy! CLICK HERE to request your own customized fairy outfit today! Thanks to a fantastic article from Ask Men, a mens magazine, here are the results from some ideas compiled on best gifts for your woman on Valentine's Day! The gifts listed appeal to each of her 5 senses. Choose the sense below you'd like to appeal to, and you will find a fantastic list of ideas for your girl! New Thirty-One Photos from the Spring Catalog! Thirty-One launched it's new Spring Catalog for 2013 on January 1st. If you haven't yet received a catalog, check out the photos just posted HERE, and start shopping HERE! If you haven't yet heard about the latest social media craze, then you might live in a closet. Pinterest is keeping woman up late at night, increasing the electric bill with hours of 'pinning', and is helping moms feel like underachievers all across America! Pinterest is for the crafty and culinary experts at heart. It is a way to catalog all the things you'd like to have, make, and wish you had the time to do. I, myself, am addicted. I find that I'm 'liking' and 'pinning' things for the kids I don't have and recipes I'll never make. But nevermind all that. For businesses, Pinterest can be a fantastic way to promote your products, simply by listing them and allowing other to like or pin them. On my Pinterest page I've created multiple pages for the events I host. It's a great way to keep track of fun ideas for years to come and for future attendees to get a feel for the silliness. However... you will NEVER see my secrets posted on Pinterest. I may be creative, but I'm not crazy. You have to attend a MY BIG DAY event to appreciate the little things that the internet just can't give you!